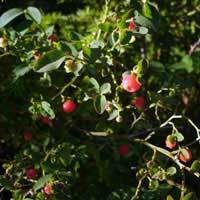 Small, white to pink urn shaped flowers, followed by red, edible (and tasty) berries. Often growing out of rotting stumps with salal. Does not transplant easily.